The second tour of Curious Incident impresses on every level with strong performances and extraordinary tech. “I find people confusing.” Many of us, I’m sure, can relate on some level to this line from Christopher, the lead character in Simon Stephens’ stage adaptation of The Curious Incident of the Dog in the Night-Time. Based on Mark Haddon’s 2003 novel of the same name, this play, which debuted at the National Theatre in August 2012, has embarked on its second national tour of the year. We follow what is essentially the inner monologue of 15-year-old Christopher Boone, a boy with Asperger’s Syndrome, with the play transporting us inside Christopher’s mind to see the world through his eyes as he tries to solve the mystery of who killed his neighbour’s dog. And yet, Curious Incident is not, at its heart, about Asperger’s Syndrome; indeed, Mark Haddon has commented that he regrets his book being labelled with the term. Christopher doesn’t see himself as having a ‘condition’ or a ‘disability’, but simply as different from those around him, and as we look at the world through him we should ask ourselves: don’t we all feel a little like that in one way or another? As Mark Haddon has said, “Curious is not really about Christopher at all. It’s about us.” The role of Christopher is unsurprisingly a hefty one as he is onstage for the whole play, and Scott Reid’s portrayal was highly impressive. He treats the role with the sensitivity it deserves, while performing the part with the amount of truth needed to transport the audience into his way of thinking and bring us on the journey with him. And transported we were: in the show’s moments of silence, not a sound was to be heard throughout the entire auditorium as the audience watched on, mesmerised by the action taking place on stage. What was truly mesmerising about this production, however, is what can only be described as the bombardment of tech unleashed upon the stage. The technical crew who work on Curious Incident have an abundance of lights, sounds and special effects at their disposal, and its these elements are what drive this performance. Right at the start, the auditorium is thrown into darkness as the cubic stage comes alive with bright lights, loud electronic music and the actors entering and taking their positions in a mechanical fashion. This aggressiveness presented through tech conveys Christopher’s discomfort with aspects of life effectively throughout the performance. The design of the stage as a mathematical-looking cube with its hidden cubby holes, a toy train track which Christopher builds across the entire stage and plenty of space for him to draw all over the set with chalk is inspired, visually taking us inside Christopher’s mind to see how he thinks. With the structure of the show forming around Christopher’s internal monologue, and the small ensemble of actors establishing the world and people around him as he sees it, the show is almost Brechtian in style. The ensemble must be commended as much as Reid, as they are constantly multi-roling and many moments in the production focus around challenging physical theatre which the actors pulled off seamlessly. Lucianne McEvoy stands out from the rest as Siobhan, Christopher’s teacher who speaks his mind out loud for the majority of the play. This is another role which demands the perfect balance between theatricality and truth, a balance which McEvoy achieved successfully. Overall, the touring production does a fantastic job at transporting the National’s masterpiece to regional theatres. Having been lucky enough to see the production in London three years ago, there are a few aspects of the show which have been scaled down, but this is understandable and expected with a tour. This production is nonetheless a brilliant one; Simon Stephens is superb in presenting Christopher and Asperger’s Syndrome, as Mark Haddon is in the novel, removing the stigma around the subject and instead uncovering the human beneath the ‘condition’. As well as this, the production aims to show what universal truths we, as an audience, can learn from this bright and brilliant 15-year-old boy. I would recommend this special, heart-warming performance for anyone. Oh, and if you do catch the show, make sure to stay in your seat after the bows: what follows is worth the wait! 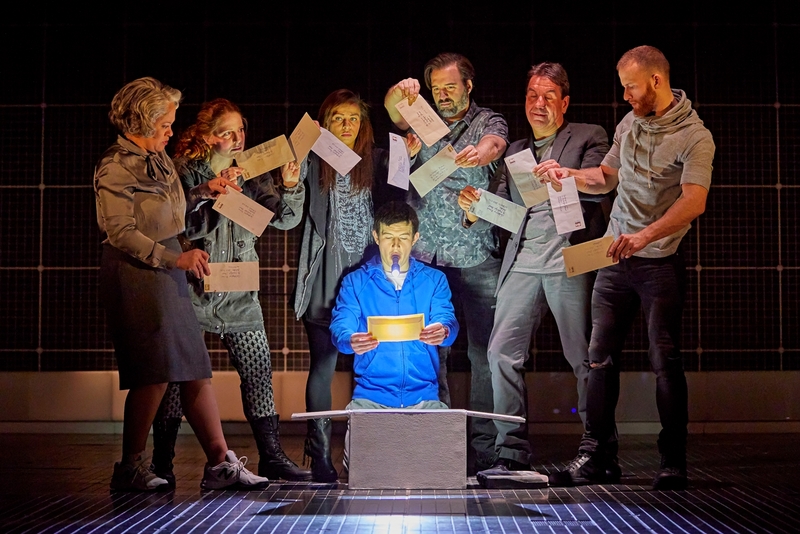 The Curious Incident of the Dog in the Night-Time runs at the Mayflower Theatre, Southampton, until Saturday 1 April.